Real Madrid gained a measure of redemption at the Camp Nou by holding Barça to a 1-1 draw on Wednesday to take the upper-hand in the semi-final of Copa del Rey. Neither Lionel Messi nor Gareth Bale were named in the starting line-ups for this first leg but their replacements filled the void as Malcom‘s curling shot cancelled out an early opener from Lucas Vazquez. After an impressive opening 20 minutes, Madrid were largely second best in a compelling, if unspectacular, Clasico but the result leaves them well-placed heading into the second leg at the Santiago Bernabeu on 27 February. For Santiago Solari‘s side, a resilient, gutsy display will also help erase the memory of their humiliation here in October, when they were thrashed 5-1, a result that caused Julen Lopetegui to be sacked the following day. Instead, it was the young guns that took centre stage. 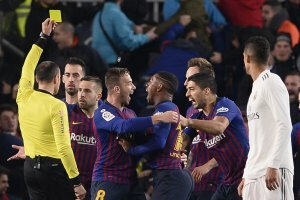 Vinicius Junior, the youngest Real Madrid player to feature in a Clasico this century, was his team’s greatest threat until the 18-year-old departed in the second half. Malcom was just as unpredictable and in the end, it was his goal that keeps Barça on level terms. Neither side seemed sure how much to commit for a winner. Messi twice weaved through but the best chance fell to Bale, who received from Benzema after Marc-Andre ter Stegen’s skewed clearance. The goal was open but Bale’s touch was heavy and Semedo jumped to make a crucial block.